1 - 11 $43.34 ea. 12 - 23 $42.21 ea. 24 - 35 $40.63 ea. 36 - 47 $39.64 ea. 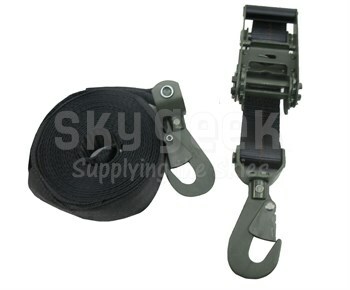 Keep your most important loads safe and secure with a Military Specification Tie-Down from SkyGeek. The heavy-duty cargo ties can be used on vehicles, luggage transports and more with reliable results. They are easy to use and the tie-downs come pre-assembled with built-in ratcheting hardware to get the perfect hold, every time. A secure metal clip on the end of the tie-down makes it easy to attach to crossbars, truck beds and more. The tie-down is made of a heavy-duty nylon material with metal hardware and is wide enough to offer security without damaging sensitive cargo.